Presenter SCORE District Director and Mentor, William Ritter, will examine the components of writing a Business Plan for internal or external use utilizing the model developed by the Small Business Development Center, the SBA and local financial institutions. You will learn methodologies for assessing your business plan, how to assess competitive analyses, create a marketing plan, and look at various types of business organizations. This presentation will answer the ongoing question, “Why Plan my Business or Have a Business Plan at All?” All of the participants will be provided with the option of working with a SBDC or SCORE Business Advisor to assist with the development of their Business Plan. Presenter Bryce Reynolds holds an MBA in finance and is a certified SCORE Mentor. One of the greatest challenges of developing a new business involves developing a business model that ensures profitability and a positive cash flow. Participants will review processes for developing a business budget, managing cash flow, and preparing a reasonable forecast. The presentation will incorporate an overview of potential funding sources budget on budget assumptions and business goals. Presenter Michelle D. Catan, NYS Certified Business Advisor, SBDC New York, will lead a guided round table discussion with several local lending institutions. They will review various aspects of lending and managing debt. Attendees will have the opportunity to participate in an open dialogue to express ideas, concerns and questions. This session includes, but not limited to some local financial representatives from the NBT Bank, Community Bank, Bank of Cooperstown, Key Bank, SFCU and the SBA. Business owners will learn the concepts behind developing a sound and cost effective marketing strategy for their business including traditional advertising and marketing mediums, internet strategies and guerilla marketing tactics. (Panel presenters to be announced) A panel of esteemed business executives from diverse organizations will discuss their experience; review struggles and lessons learned and provide some valuable coaching on best-practices. They will field questions and serve to coach you with ideas and techniques to encourage and support business growth. Presenters Kathryn Bamberger of Empire State Development, Stephen Day, President of the Global Business Alliance and William Ritter of SCORE District Director will discuss how exporting can work for your business and how to get started. 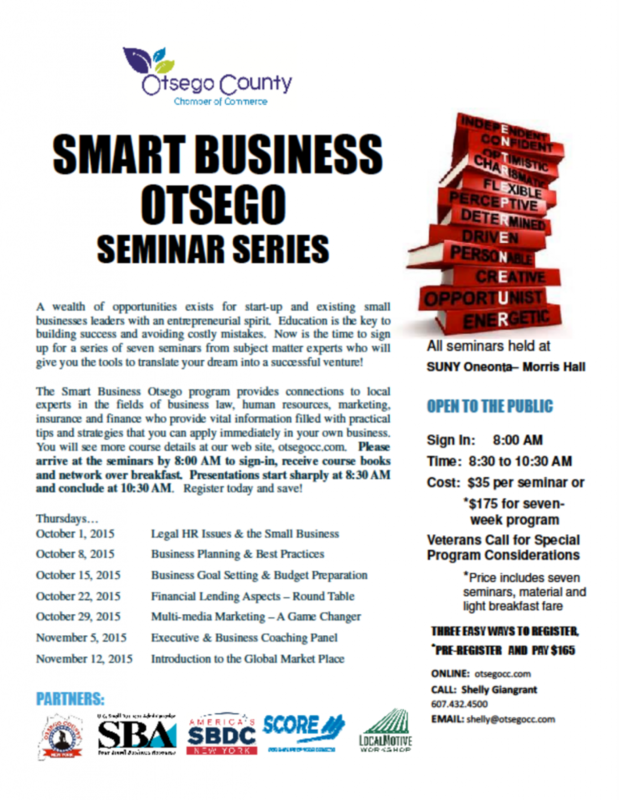 Come; learn about the programs, services and other support resources available to businesses in New York. You will explore opportunities to market and sell your products and services in markets outside of the USA. 95% of the world’s population lives outside of the USA. Small and medium-sized firms account for the vast majority of growth in new exporters. More than two-thirds of exporters have fewer than 20 employees. Most exporting companies are more nimble and flexible and PROFITABLE and become the employer of choice in their community and their industry.